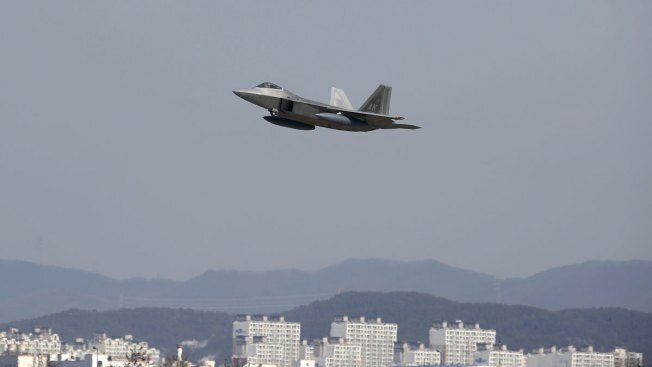 FILE - A U.S. F-22 stealth fighter deployed to the Korean Peninsula as a response to North Korea's nuclear and missile threats. The White House announced Wednesday tougher sanctions against North Korea in response to nuclear and missiles tests conducted earlier this year. President Barack Obama is imposing new sanctions against North Korea in response to recent "illicit" nuclear and ballistic missile tests. White House press secretary Josh Earnest announced the president's decision on Wednesday. Earnest says the new unilateral sanctions will allow the U.S. to implement sanctions unanimously agreed to by the U.N. Security Council. North Korea said it tested a hydrogen bomb in January. It followed that with the launch of a ballistic missile last month. Earnest says the new sanctions are consistent with a longstanding commitment by the U.S. to keep pressure on North Korea. He says the U.S. and its allies will continue to impose costs on North Korea until it meets its international obligations.